We're a long way from Dunk in the Dark, but don't expect brands to stop trying to take advantage of events in real-time, even if the practice isn't as buzzy as it used to be. Oreo won the marketing MVP trophy at Super Bowl XLVII in February 2013 with its much-buzzed-about real-time Dunk in the Dark tweet. The quickly assembled activation, which took advantage of a blackout at the Mercedes-Benz Superdome during the big game, prompted breathless praise from across the marketing industry and predictions that it had ushered in a new age of fast-moving social marketing. 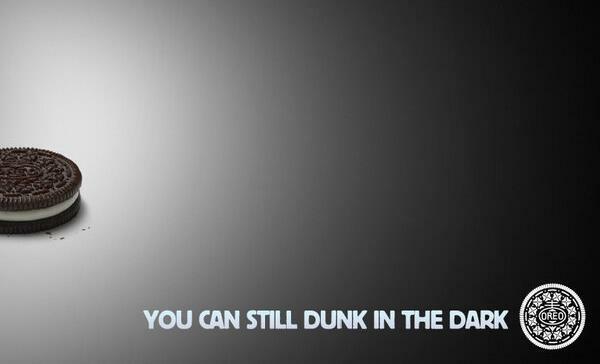 However, six years later, the Dunk campaign would barely make a splash, says Lisa Mann, former VP of cookies at Oreo parent Kraft and the final person to approve the big game tweet before it went live. When it comes to real-time marketing, she says the "walls have closed" due to too many brands trying to follow suit and failing miserably or coming across as inauthentic. "Real-time marketing is now overrated and is sought-after for the wrong reasons," says Mann, who now runs her own consultancy, Think Marketing. "As opposed to building brand equity, it is a lemming thing. ‘Other brands have done this well, so I want to do well.’"
Even though Oreo’s team had been planning how to quickly take advantage of events, Mann describes the Dunk in the Dark tweet as fun, real, and spontaneous at a time when brands weren’t as tied to daily pop culture as they are today. Similar real-time tweets in 2019 feel prescribed, she says. "Back then, it was unique to be commenting on culture, whereas now everyone is trying to do it," explains Mann. "If Oreo did that now, it wouldn’t make the same kind of impact." Jim Lin, SVP, digital strategist, and creative director at Ketchum, says Oreo’s tweet was smart, relevant, and amusing, and contends it would get the same social media reaction today that it did in 2013. Yet because most brands are jumping on content in real-time, a tweet like Oreo’s would not get the same attention from traditional media outlets, he says. "There was more of a surprise factor back then, so it got a lot more shares and media attention drew more people to that tweet, which led to more engagement," says Lin. Experts agree that real-time marketing has lost its novelty. The tactic has been overused, the "wow factor" is gone, and it’s not getting the same response from consumers. However, it can still be an effective part of the marketing mix, and the ROI can be greater than any other tactic in the playbook when executions work, notes George Fiddler, creative director at ICF Next. "Good real-time content is still appreciated and can be a strong play for a brand, but appreciation doesn’t result in trending on Twitter or dominating the conversation," says Lin. "It still moves the brand forward in building equity and in conveying the brand’s personality. It is more of a long game now than a lightning-in-a-bottle thing." And in some cases, consumers expect it. For instance, in 2016, Red Lobster got flack from the Twitterverse for its delayed response to a shoutout in Beyonce’s song "Formation." "The more time that goes by, the less relevant your tweet becomes or the more your audience is expecting something really awesome, and if you don’t deliver, they will jump on you for it," says Lin. "But brands are getting better at trying to play in that space." So what’s next for real-time marketing? Brands having direct conversations with consumers on social media in tweet replies or Instagram comments, says Lin, in response to consumers expecting brands to have their own personalities on social media. "The biggest change in real-time marketing is the conversational element in social," he says. "Brands are less afraid to act and speak. Real-time marketing used to be just the content, but now the content is the spark for conversation and helps brands build a relationship with followers." Brands are also treating the conversations they have with their audiences as content. "People love to see how a brand is going to respond," says Lin. "The people who get responded to love it and share it, and sometimes that is the best content on a brand’s social channels." While marketers wanted to be Oreo in 2013, now they want to be Wendy’s. While Oreo had a one-time real-time moment, Wendy’s uses consistent conversation as a content play. People tweet at Wendy’s, and everyone waits and watches with bated breath for what the burger brand will say back. "We love seeing how the QSR -- Wendy’s, Burger King -- and CPG brands -- Pop Tarts, Moonpie -- are starting conversations every day on Twitter," says J.P. Maheu, VP of U.S. client services at Twitter. "Not only do they connect with consumers but with each other as well." Real-time marketing has had another impact on marketing: it’s forced legal departments to loosen the reins on social media strategy. "The more successes, engagement, and positive equity we see that is built for brands through real-time social content, the more legal departments will let up a little bit and look at social through a little bit of an adjusted lens," says Lin. He predicts that, despite experts agreeing that the novelty of real-time marketing is gone, social media teams at agencies and in-house will only get bigger as brands focus on quick reactions. "They used to have just a few folks that knew how to use Twitter, but because of the necessity for more social listening, brand social teams are incorporating that a lot more," says Lin. "It requires more resources to do that constant listening, ideation, and more vetting must be done because when you jump on real-time you must be careful."